I don’t know about you but there are certain books that I remember from my childhood – either from school or at home. One of them is Dear Zoo. So when I found out it was celebrating its 30th Anniversary this year I wanted to get in on the celebrations. 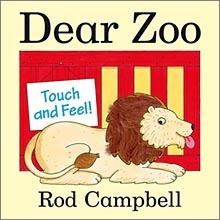 Since it was first published in 1982 Rod Campbell’s Dear Zoo has sold over 5 million copies in the UK. It consistently features in the top selling children’s titles lists and is a firm family favourite. A very clever book that my fifteen-month-old daughter (Sophie) loves. The book begins ‘I wrote to the zoo to send me a pet. They sent me an…’ and leads the reader through the animals the zoo sent in reply. At Sophie’s age kids are generally trying to say all sorts of words and the big, colourful illustrations certainly support this learning. This obviously leads to a wealth of simple words; eyes, ears, tail, teeth, legs etc. Rod Campbell has gone one step further with ‘Dear Zoo touch and feel book’ which includes lots of different textures and descriptive words like ‘bumpy’ and ‘sticky’. Even though the pictures are big and there are only a few words on a page, the book appeals to my three-year-old son too as he helps to describe the animals and there’s plenty for him to do. This makes it a great book to read with both kids as it can be as a quick read or else we can take quite a while if time allows. A lovely book for young children. HAPPY 30th ANNIVERSARY DEAR ZOO! A copy of Dear Zoo was received for consideration. As always our review is completely honest.